Change is one of the great paradoxes of life. While change, or the possibility of change, is a key source of positive energy and even excitement, it is also a source of extreme personal stress and anxiety. Change Basics offers a single reference point for anyone seeking to understand, manage, and lead change. In addition to useful tools, tips, and strategies that will enable you to skillfully introduce and manage change, this book offers an essential baseline education on the effects of change and why people tend to resist it. The practical advice provided in this book is enhanced by a powerful four-phase model that will help you understand and respond to the emotional journey most people follow during a change initiative. 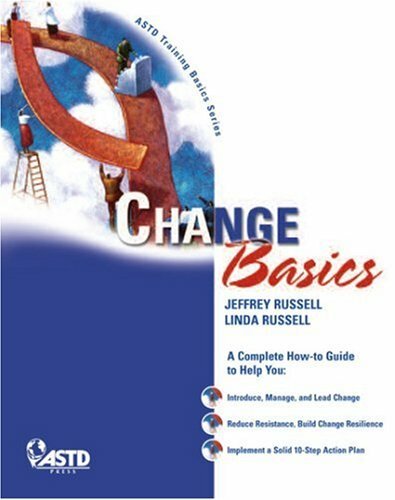 In addition, Change Basics offers content on more nuanced aspects of change, including • using appreciative inquiry methods to identify issues and organizational assets that will facilitate change • understanding the importance of an effective communication strategy to support change efforts • building employee resilience to face change • understanding and clarifying roles and responsibilities of change leaders and managers.